Just 4 days after fire charred the upper floors of the Monte Carlo on the Las Vegas Strip workers enter to begin repairs. 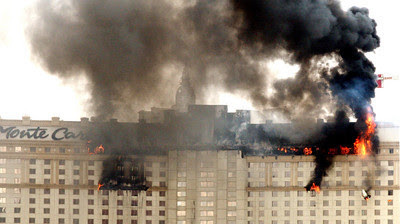 On Friday, thousands were evacuated as flames shot out of the top floor windows. The smoke could be seen from many parts of the valley. Yesterday visitors were allowed to return to collect belongings. They had been displaced to other MGM properties and comped their stay so they would feel it was OK to return. The casino will open as soon as possible. Both fire damage and water damage affect the reopen but efforts will be focused on the reconstruction so operations can be restored.